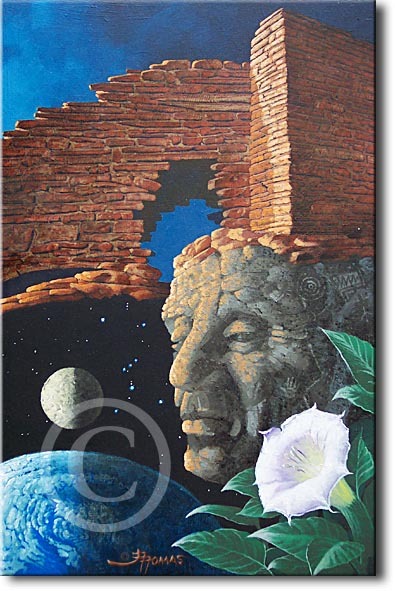 Focus: Hisatsinom (ancestral Pueblo people of the American Southwest, i.e., the Anasazi, the Sinagua, the Hohokam, etc. ), the Hopi, the Maya and other Mesoamerican tribes, rock art (petroglyphs and pictographs, especially from the Four Corners region of the US), archaeology of the forenamed peoples, archaeoastronomy, astronomy pertaining to Orion. The following links are by no means comprehensive, and are added as time and energy permit. Hundreds of years ago, Southwest Indian tribes came by foot to this ceremonial site in the high desert for solstice rituals, feasts and trading. Did Polynesians visit Southern California many centuries ago? The evidence — some fishhooks, a boat design, and a few words in common — is limited. But to some those clues are tantalizing, even persuasive. Many tribal nations, significantly the Hopi and the Haudenosaunee... have prophecies within their spiritual traditions that describe an ''end of times,'' an era very similar to our present times and depicting or describing prophetic signs apparent to those who watch for such things. A team of scientists came to this controversial conclusion by dating human footprints preserved by volcanic ash in an abandoned quarry in Mexico. Did ancient Polynesians visit California? Maybe so. Scholars revive idea using linguistic ties, Indian headdress. From Hopiland, a spiritual vortex for Native people, spiritual leaders Dan Evehema and Thomas Banyacya became the voice of the voiceless: the birds and animals. Warning of the impending apocalypse, they urged all people of good hearts to join them. Astronomers have produced some amazing pictures using a remarkable new instrument on the United Kingdom Infrared Telescope in Hawaii. The newly discovered ruins of an ancient civilization in this remote eastern Utah canyon could reveal secrets about the Fremont people. Thornborough may well be Britain's most important henge monument. Sign the petition! A recent theory is that the Thornborough henges' alignment may follow that of Orion's Belt. A star is born in the M78 reflection nebula of Orion. See NASA's Astronomy Picture of the Day. Is the Kennewick Man actually Capt. Picard back from the future? Toward the end of the 13th century, something when terribly wrong among the Anasazi. What awful event forced the people to flee their homeland, never to return? New evidence presented indicates that occupation of many of the ancient pueblos was an on-again, off-again thing over the centuries. Mammoth tusk sliver found in German cave depicts Orion. Carbondated between 32,500 and 38,000 years ago. Was Maya Pyramid Designed to Chirp Like a Bird? Researchers investigate acoustical phenomena in Chichen Itza and Teotihuacan. communications, dating to 650 B.C...."
Does skull prove that the first Americans came from Europe? Skull of the 26 year-old Peñon woman found among the suburbs of Mexico City was dated at "...13,000 years old, making it 2,000 years older than the previous record for the continent's oldest human remains." On the morning of the winter solstice three bright stars in Orion rise over three of the monoliths in the Great Zimbabwe. 1,150 light-years away, SOri70 may be either a Jupiter-like planet or a brown dwarf. One of the most significant finds in the past 20 years involving the ancient civilization of the Maya. CARAL, Peru - In a barren landscape that now looks like the moon, a mysterious culture built pyramids nearly 5,000 years ago. New distinct ancient culture found in Arizona. Birthplace of civilization in the Americas? Ek Balam: The Tallest Mayan Pyramid, the "Gate of Hell," and an equinox alignment. A theory on how the Egyptian pyramids were aligned to true north, and when. Star map found in the caves at Lascaux suggests that their inhabitants were cognizant of the zodiac-- 11,000 years before the Sumerians! On one of the maps an exquisite rendering of a bull was painted adjacent to a representation of the Pleiades. how does he pray? Will you tell us?" and scatters the sacred cornmeal. Then he prays for all the people. and that our fields may bring us plenty. and be happy and good in their hearts. for everybody in the whole world. Lololomai prays for all the animals. Lololomai prays for all the plants. That is how Lololomai prays." Adapted from The Indians' Book by Natalie Curtis. What Osama Bin Laden Doesn't Want YOU to Know About the Phoenicians and the Jews! by Gene D. Matlock, B.A., M.A. Who's The Enemy -- Really...? Read the Enterprise Mission's analysis of the terrorist attacks. No Cipro? Link to an article on natural antibiotics by medical journalist Bill Sardi. How do our dead find us? but were still here listening. that settled at our feet, a hush covering. and their going was so swift. Do we know what circulates in thought in the last minutes? become a reel of film that plays over and over. as the years go forward. and with reverence each gathering night. and dream joys for them. of pure white snow, messages from the sky. Judy Platz is an adjunct college teacher of English, lives in the country where she tends the woodstove and grows food. Poetry books published are: Tending the Dark and The Silence of Light. It is not now, nor has it ever been, one's patriotic duty to "go shopping." If this is what love for one's country is, then I don't want any part of it. Whenever possible I avoid malls because they give me the creeps, so I certainly would not go to one on Halloween. The Mall of the Americas and its ilk are not the essence of the United States, even though consumerism and conscience are synonymous in the minds of many. Our president advises "business as ususal," albeit with a heightened sense of vigilance. This is a fallacy. Nothing will ever be "normal" again. These events appear to be a manifestation of the current geo-karmic cycle and the fulfillment of Hopi prophecy, I'm afraid. We might be able to "buy time" with good works, such as the heroic deeds of the rescue workers at Ground Zero or the small, anonymous, altruistc acts of the past month that confirm the notion that, as some have said, we are indeed spiritual beings merely having a physical experience on this planet. However, we will never be able to stay the inevitable by buying things. I would like to quote from "Spiral Gate: the Arc of the Covenant," one of my own essays that I published in August on this web site. "As we have seen, the Spiral, or "gyre," is the elemental gate between worlds, realms, dimensions, individual life spans. Perhaps our current onus should be to help stabilize the dipole of the revolving/evolving axis which the Hopi warrior twins are keeping in precarious balance. Maybe the center can hold, if only we abide by the Arc of the Covenant and heed the hermetic maxim "As Above, so Below." If we manage to do this, the Creator just might let us walk a while longer upon the Spiral's numinous path." I think Yeats' poem was never as important during his lifetime as it is now. The "best" and the "worst" of us are commingled, while we struggle to make sense of these chaotic times. Thus, let us show some compassion when each of us, in one instance or another, fluxes between the extremes.